Over the course of the last several months, we've been finding earthworms in various stages of desiccation in our basement. Once we found a semi-dried specimen in our family room. Another time, near my husband's home office. This weekend I found a crunchy one near the laundry area. We haven't been able to pinpoint their entry point and I'm somewhat concerned. If earthworms are able to squeeze their way in, what's next? And after a costly basement flooding last year, the fear is that water may be coming in. Concerning and baffling. 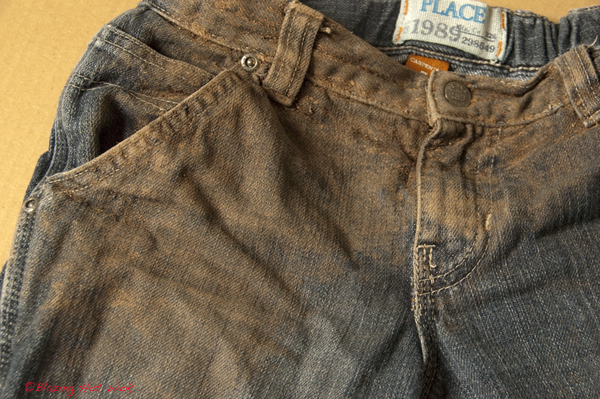 When I was doing laundry this weekend, I found a pair of mud-crusted jeans hidden in the depths of my son's laundry basket. (See photo below.) There was no mystery about what I was looking at or even how it happened. The kid is 7 years old. He's a boy. There's a magnetic attraction between boys and mud. The mystery was why they were in the laundry basket. Hubby is in charge of picking the kid up from school on the evenings I teach. I'm assuming that he saw the kid was caked in mud. I'm assuming he made the kid change into clean clothes when they got home. What I'm wondering is why he didn't take the jeans and soak them in a bucket to get the mud off. I'd ask him, but he's away at a working conference and it seems petty to send a text, written in all caps, asking him that very question. Instead, I decided to blog about it. Yes, I realize this is passive-aggressive. 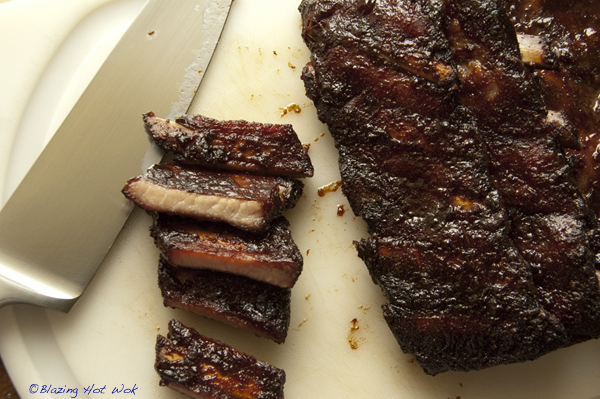 Lastly, I planned to make smoked ribs this past Friday. The weather would have been perfect for it. But when I opened the package, I saw the most bizzare butchering job ever. 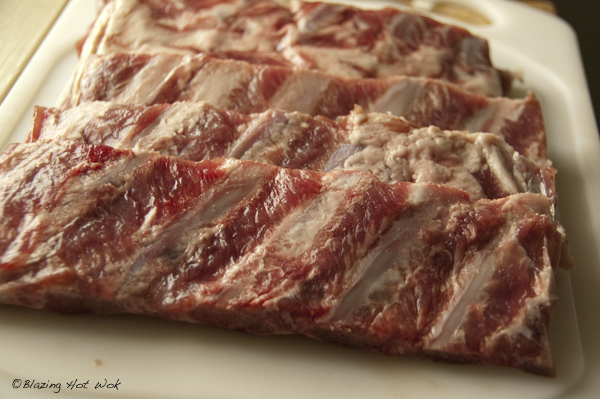 (See photo below) From the way these spare ribs were packaged, I thought they were just cut in half, which would have been fine since a full rack is usually too long to fit across the diameter of my smoker. No, they weren't cut in half. They were cut into thirds, then in half lengthwise and the edges trimmed St. Louis style. The two meaty end pieces didn't even have proper bones in them, just the cartilage. As it is, pork spare ribs aren't as meaty as baby back ribs, but this lot just looked puny, not really worthy of firing up the smoker for. After some consideration I decided to do them in the oven, char siu style. I figured, I could serve them as riblets and Sonny would have some fun eating them with chopsticks. Combine all the the ingredients in a large Ziploc bag and marinate in the fridge 8 hours and up to 24 hours. Enjoy with rice, noodles, potato salad— whatever you'd like, really. If you make char siu using boneless pork country-style ribs, you can use it to make steamed pork buns, baked pork buns, this delicious noodle soup, this delicious rice noodle stir-fry, fried rice, and the list goes on.